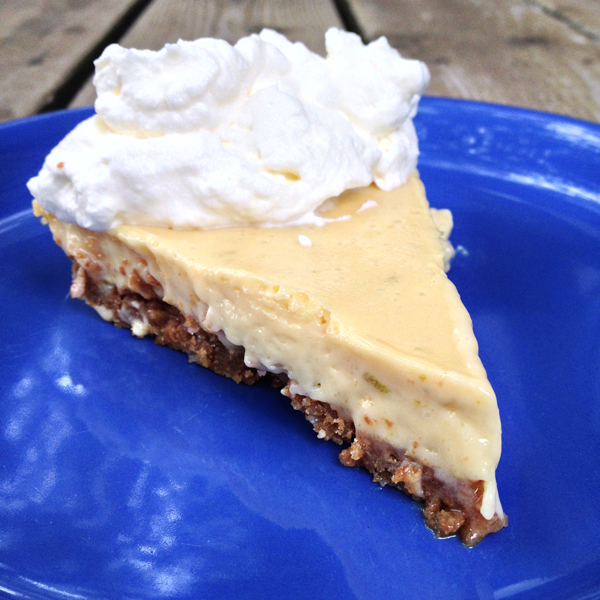 In my mind, The Birchwood Café’s key lime pie is the gold standard. The lime doesn’t cower away, it stands out boldly between the other two major forces at work: sweet and creamy. As your fork cruises through the chilled custard it stops, then goes “thunk” through the graham cracker crust. So when I spied a bag of key limes (which aren’t always readily available, just so you know) I did my best to replicate perfection. I think I came close, although the topping is just whipped heavy cream. I suspect Birchwood adds some butter to theirs. Make the crust. Preheat the oven to 350° F and place the oven rack in the center of the oven. Butter a 9-inch pie or tart pan. Mix together the graham cracker crumbs, sugar, and melted butter. Turn into the prepared pie pan; press the crust down in the middle and work your way up the sides, going all the way around the pie dish. Bake for about 7 minutes or until set. Remove from oven and place on wire rack to cool. If the crust shrunk, gently press it back into place using a wooden spoon. Make the filling. In the bowl of your electric mixer, with the whisk attachment, beat the egg yolks until pale and fluffy, about 2-3 minutes. Gradually add the condensed milk and beat until light and fluffy, about 3-5 minutes. Scrape down the sides of the bowl and then beat in the lime juice and zest. Bake the pie until the filling is just set. Pour the filling over the crust and bake for about 10 – 15 minutes, or until the filling is set. Do not overbake! Shake the pan gently. If it barely or doesn’t jiggle, it is done. Remove from oven and place on a wire rack to cool. Once it has completely cooled, cover and refrigerate for several hours or overnight. Make the whipped cream. Once the filling has chilled, in the bowl of your electric mixer, with the whisk attachment (or with a hand mixer), beat the whipping cream and sugar until stiff peaks form. Either pipe (if you wanna be fancy) or place mounds of whipping cream on top of the filling. Can be stored in the refrigerator for a few days. Makes one 9-inch pie or tart.